This model is a modified CREATOR set called Lighthouse Point. 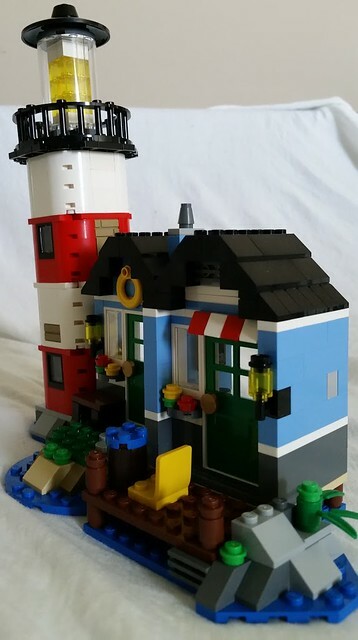 (set number 31051) I removed the light-up brick and as such changed the top of the tower, along with tweaking the inside details and adding a custom Lighthouse keeper out of 1990's mini-figure parts. The model has modular parts out the wazoo, with a whopping 10 building sections. (their was one one more module from the set, but I removed it before taking pictures.) 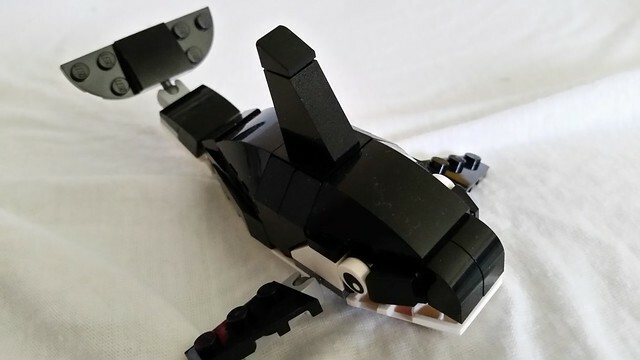 The set also comes with a killer whale / orca. You may have also noticed I had a bunch of trans - yellow bricks from a Classic Space build left over. They made a good replacement for the light brick. 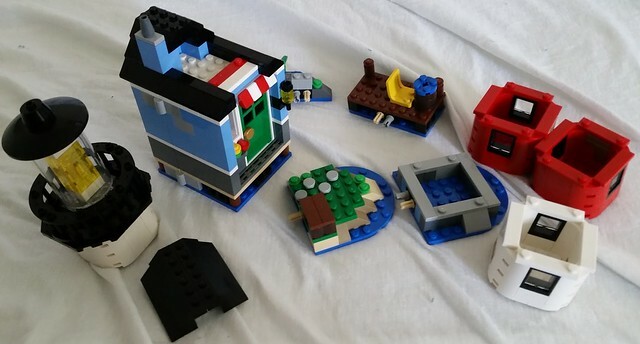 The set contains 10 modules as follows, (in no particular order): Tower top with light, building roof, building proper, small dock, exposed small rock, exposed large rock, tower foundation, two red tower modules, and a white tower module. This cute critter comes with the main model of set 31051. His flippers move, his tail flops around, and his jaw opens to swallow fish.... or unwitting swimming mini-figures! Thier is no LDD file for this build, but it shouldn't be too hard to recreate what I did, right? To be honest I'm not sure what this topic is supposed to be? Is it a review? Does it show of a mod? If so, with all do respect, the changes are so minor, I had to look twice. 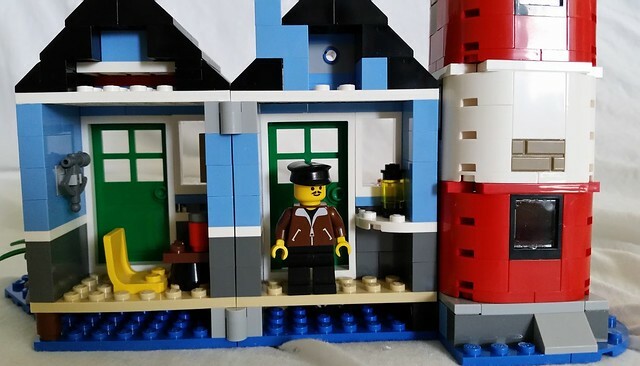 I am all for sharing MOC's, MOD's and whatnot but this topic feels a bit redundant because of the minor difference between this and the original. Sorry, had to be honest. I changed the light brick to trans yellow bricks and added a few bits here and there. Since their is no review yet for this model, I though i would show it off, and my mods to boot.... sorry if that wasn't clear.